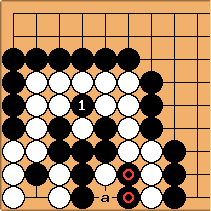 White captures the black stone by playing at ''a''. Black cannot recapture according to Ko. Just as usual, but the white stone that cannot be captured is said to be __hot__. ... and the white stones are hot! Black may not recapture them immediately. He has to play somewhere else first. Black plays the move 3 somewhere else, and he may now recapture the stones, returning to the original position. Twin (single) hot stones. After black captures at ''1'', white may not recapture at ''1'' or BC. He has to play somewhere else first. Twin hot stones (one single and one double). After black captures at ''1'', white may not recapture at ''1'' or ''a'' immediately. He has to play somewhere else first. The group on the lower right is a balanced double ko. The Ing ko rule is actually very simple. RobertJasiek: The Ing Ko Rules are so difficult that so far nobody understands them fully. - YHWH? : It seems like a lot of people understand them, but some people don't want to. - RobertJasiek: Quite some people (especially politicians taking money) pretend to understand them but, when asked, are unable to explain them. Quite some others don't want to understand them. A tiny number has spent a lot of time trying to understand them; e.g., I have spent ca. 2000 hours but it has not been enough. RobertJasiek: If one counts practically occurring games, then a fight about just one basic ko is the by far most frequent shape. For that, Ing Ko Rules and a superko rule provide the same move restrictions. If one considers all known ko shapes, i.e., most of which are rarities, then Ing Ko Rules and superko lead to quite some differences. - YHWH? : Yes, that's exactly what I said. and it's basically the normal ko rule extended to also support superko situations (which are called "complex ko:s"). RobertJasiek: Every ko ruleset could be considered "basically the normal ko rule extended to also support superko situations". So the statement is pretty much meaningless. YHWH? : The normal ko rules says: "In a situation where a stone is captured, the other player may not immediately recapture the capturing stone so that the previous board position is repeated." The Ing ko rule works exactly the same way for the basic ko. The Ing ko rule says: "In a cyclic sequence, the capturing stones that may not be re-captured, are said to be hot." RobertJasiek: The Ing Ko Rules do not work the same way as the basic ko rule (and especially not "exactly" the same way) because basic kos can occur also in disturbing kos while these do not have any hot stones. - YHWH? : You are contradicting yourself. Yes, it does work exactly the same way for the basic ko. RobertJasiek: If you claim that I contradict myself, state clearly where and why! - Once more: Hot stones do not exist in disturbing kos, according to the Ing Ko Rules. So you state a falsehood when saying it would be the same for the basic ko, regardless of whether it is part of a disturbing ko or not. After some relevant capture, basic kos that are not part of disturbing kos have hot stones while basic kos that are part of disturbing kos do not have hot stones. Note the difference: with versus without hot stones. That is not the same! White captures the black stone by playing at a. Black cannot recapture according to Ko. Just as usual, but the white stone that cannot be captured is said to be hot. In practice, this is identical to the normal ko rule. It's nothing special about it, the stone that you can't capture is just hot and that's it. RobertJasiek: Earlier you wrote that the rule would be simple, but you forgo the most difficult part: the identification of what is and constitutes a "fighting ko". - YHWH? : No, I did not, it is described further down. RobertJasiek: You an eternal life example, then you say: "This is called fighting ko:s". An example is not a general rules definition! State your general rules definition here! So far there is none by you. YHWH? : A cyclic sequence is a sequence (any sequence of any length) that, if played out, returns to the previous board position. RobertJasiek: You should say whether the rules say so, this is your interpretation, and how you derive the interpretation from the rules. - YHWH? : There is only one interpretation. If you have another, feel free to add it, preferably without messing up the whole page like you've done. RobertJasiek: Mine is here: New Ko Rules, Ing Ko Lecture, Ing Ko Epilogue. Previously the page consisted more of links than contents. You have tried to provide some contents. However, it contains so many mistakes and gaps that it has to be discussed. Do not make unproven statements as if they were facts. If you do, they will be and will have to be criticised, as I do. YHWH? : If a capturing move is made in such a sequence, the capturing stone (or stones) may not immediately be recaptured (they are hot). RobertJasiek: How to identify that a move is part of "such a sequence", where you mean "cyclic sequence"? As I have proven mathematically, ANY board play can be part of a cycle%%% - YHWH? : No, it can not. Such a sequence is identified by that, if the sequence is played out, it returns to the previous board position and stops the game from progressing (hence "cyclic"). I think this is explained very clearly, but feel free to rephrase it if you don't. RobertJasiek: Statements like "No, it can not." are not arguments. Once more: There is a mathematical proof for "ANY board play can be part of a cycle". Mathematical proof means: 100% true. I posted it to the mailing list computer-go several years ago. The principle idea is pretty simple: First let the players remove all stones from the board except for one stone. Then let Black play on all the black intersections of the previous position while White passes. Then let White play on all the white intersections of the previous position while Black passes. (The proof requires a few more details, but this is the basic idea.) Result: Start with any board play and afterwards the position can be recreated. - Of course, you notice that in most cases this is not perfect-play-alike. However, for the purpose of defining "cycle", perfect play is not a matter yet! In particular, even for your definition "A cyclic sequence is a sequence (any sequence of any length) that, if played out, returns to the previous board position. ", perfect play is not mentioned yet. RobertJasiek: So you need more: A distinction of board plays that may versus may not be made. And you ought to make that independent of being part of a cycle because of the aforementioned reason. Instead you need some reference to perfect play under some preliminary assumption of using only preliminary ko rules (because we are still constructing the real ko rules). If you did not use any preliminary ko rules, you would get into the "any board play can be part of a cycle" problem again. So which are your preliminary ko rules, and why / how do you derive that from the Ing Ko Rules? - YHWH? : "Hot stones in a cyclic sequence may not be captured without an intervening move", is the Ing Ko rule, from which all of this is derived. It's clearly explained if you look at the whole description of Fighting Ko rather than picking everything apart and analyzing every sentence. I think it's very clear but feel free to clarify or rephrase anything you think is vague by just editing it. RobertJasiek: See my webpages for clarifications as far as possible. - Your opinion "I think it's very clear" explains nothing to us. Please explain! Which "whole description of Fighting Ko" are you referring to? Your cited sentence (which fails to define Fighting Ko, to start with), your example together with your earlier writing about Fighting Ko (from which I do not see a general explanation), or the Ing rules booklets' explanations (from which I do not see a general explanation after 2000 hours of study)? This is called fighting ko:s. There is one exception to this rule, and we'll come to that. First, some more examples. Twin (single) hot stones. After black captures at 1, white may not recapture at 1 or . He has to play somewhere else first. Twin hot stones (one single and one double). After black captures at 1, white may not recapture at 1 or a immediately. He has to play somewhere else first. RobertJasiek: Examples are not rules. What are the rules for multiple and twin hot stones? State them before you apply them%%% - YHWH? : "Capturing stones in a cyclic sequence may not be recaptured", I believe it's been mentioned at least three times so far. The exception to this rule is balanced kos. RobertJasiek: The Ing Ko Rules do not advertise disturbing kos to be an exception to fighting kos but a priory want to classify (!) kos as either fighting kos or disturbing kos. - YHWH? : I would think of it as an exception, because in a disturbing ko you don't have hot stones. Since hot stones is the whole thing with the Fighting Ko rule, Disturbing Ko is, by any practical definition of the word, an exception. In a balanced ko, each side has the same amount of separate internal liberties (at least two). RobertJasiek: Since you want to define "internal liberty" by "internal to the group", "eye", and "false eye", please define these three phrases! However, see my second examples webpage for Ing Ko Rules, where I have given an example, where necessarily one cannot distinguish internal from external! So the whole concept of "internal" is flawed for the purpose of Ing Ko Rules. Take my advice: Life will be easier for you if you do not attempt to explain Ing Ko Rules by "internal" or "eye". - Why do you insist on defining "balanced ko" by exactly two liberties? Ing people (or was it Ing himself) gave an explanation that "at least two liberties" are meant. And this makes sense if you consider a quintuple-ko or higher n-tuple-ko. - The atari case is as relevant because the player having the turn needs to know whether he is allowed to either capture a big string or gain a second liberty again for it. - BTW, since we are speaking about liberties, what about those of the ko stones?! YHWH? : If a player initiates a cyclic sequence in a balanced ko, that is called a disturbing ko. The same player may not initiate that sequence again for the duration of the game (he may only "disturb" it once). RobertJasiek: What is "initiates"? How are you sure that cyclic sequences of even and odd length are treated the same? How do you know that the player would start the same sequence? Playing on the same first intersection does not necessarily imply the same sequence because the player or his opponent might vary during later moves! "For the duration of the game" is a new interpretation. Interesting. However, how do you justify this interpretation? Purely from a literal reading of the rules? This is dangerous because in many other respects literal reading does not work for Ing Ko Rules. - YHWH? : "Initiates" means "starts the sequence". "For the duration of the game" means each player can only start the sequence once (this is very clearly stated). It doesn't matter in exactly which order the sequence is played out, it can only be started once by each player and that's it. If you have another interpretation, feel free to add it. RobertJasiek: This is a bit clearer. Apparently you mean that the same first board play may not be made. However, this is not the Ing Ko Rules' intention. They want more: A prohibition of ANY (not immediately the ko dissolving) board play in the particular ko position in question. - As for my interpretation, see my webpages. $$ The white group in the top left corner is dead. Black plays at 1, so white responds by playing at 2. Black is now forced to play at 3, and white may recapture at 1. Now, however, white has disturbed the balanced ko, and he may only do so once in the duration of the entire game. So black captures at 1 again, and white may not touch the balanced ko in the lower right corner. White is dead. RobertJasiek: What is a "group"? What is "dead"? What is "disturb"? - YHWH? : "Disturb" is to start a disturbing ko. "Nitpicking" is to be concerned with or to find faults with insignificants details. RobertJasiek: You could make life of all of us easier if you used the same term for the same meaning. Ing Ko Rules use "disturb". So please do not use "initiate" or "start" when you mean "disturb" (unless you are just defining it)! Hence, "Moonshine Life" and similar does not live according to Ing Rules. A double ko, in which both players have an eye, is not an infinite source of ko threats, because each player may only disturb it once. RobertJasiek: In case you should be right with your "for the during of the game" interpretation. You should explain what it means when a ko shape is altered - when exactly are sequences in them still the same, in your opinion? With the superko rule, it would be an infinite source of ko threats, because the board position changes when you make another move. With the Ing rules however, such a double ko would only be usable as a ko threat once. $$ The quadruple ko is a balanced ko (because each player has two separate internal liberties). 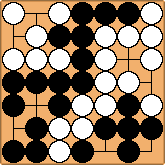 Therefore, white may initiate it once and only once during the entire game. Black may initiate it once and only once during the entire game. Both groups are alive in seki. RobertJasiek: Now you introduce something you have not introduced before: Instead of requiring "two internal liberties", you are now requiring two separate internal liberties"? Why? Why not always? How do you derive that from the rules? What is "separate"? - YHWH? : No, I wrote "separate internal liberties" earlier too. The difference is, two separate internal liberties are liberties, inside a group ("internal"), which are not next to eachother ("separate"). RobertJasiek: Ok, I get it what you mean by "separate", thanks. However, it relies on "internal", which still awaits definition (and I can tell you: it needs a couple of dozens of hours of further study and will look as ugly and formalistic as the Japanese 2003 Rules). There is yet another problem: With "separate" somehow you want to imply life. However, there are cases when "separate" is too weak a condition for life. What you really need is something similarly rigorous as a definition of two-eye-formation. This time, it will be more difficult because more shape cases and ko strings are involved. And we are at the "any string on the board is ko stones" problem again. So what is your concept to circumvent this fact? RobertJasiek: Why do you take something from a text that does not explain Ing Ko Rules correctly but deceives the reader about them by pretending simplicity where there is none? - YHWH? : Oh, so you DO know how they work after all! I think it's better to at least try to explain them, rather than just saying "this is ridiculously complicated and you can't possibly understand them". What would be the purpose with this page if you didn't even try to explain it? RobertJasiek: I do not have enough time to maintain every rules page here as correct because too often rules beginners replace factually correct contents by incorrect contents. It requires others to fill this page by a good explanation that does not just consist of links to my pages. When several persons work on the contents here, then rules beginners are more likely discouraged to continue destroying contents. It would be useless if I started to fill this page with real contents but I will comment on bad contents because I hate desinformation... Read my commentaries on Ing Ko Rules and start again (if you have enough time)! But do not expect you could avoid (approximative) definitions by giving nothing but examples! Examples for rules application are application of the rules - not vice versa. --- YHWH: The nonsense that was here earlier hardly classifies as "content" in the first place, so exactly what did I ruin except your ego? I'm not going to read everything that you wrote, it's clear that you're a jackass. Have fun with this. RobertJasiek: Whatever your opinion is, you should not use insulting words. - The previous humour on the main page was not real contents for it. I do not criticise your principle attempt to establish some real contents for the main page but the mistakes in your proposed contents, as discussed here. Contents ought to be factually correct. Explanations ought to explain and not substitute unclarity in the original rules by new unclarity. LiKao: YHWH if you claim to understand the rules why don't you just write a bit of (pseudo) code which implements them? I believe one only truly understands something if one can write an algorithms solving it. Bill: I have not plowed through the current debate between YHWH and Robert Jasiek. But let me restate my opinion that pages like this one should be simply informational, with debate and discussion elsewhere, such as in the forum or a subpage. So when the debate reaches a lull, shall we move it to a subpage, and simply use the main page for a description of the Ing 1996 ko rules, taken from the rules text? Perhaps with a few examples? As for the Kim-Simon-Straus commentary, won't the link suffice? RobertJasiek: Of course, discussion should be on this subpage. 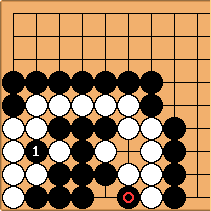 Reflame (16 kyu): I cannot understand why it is useful to use rules which only one person in Europe can understand. Would not it be simple and practical to say that if the game endlessly repeats and no player is willing to interrupt the repetition, then White wins by komi? And by the way (sorry if it is off-topic) when I see the comparison of go rulesets, I am shocked how big these differences are. And especially that the Japanese rules are the most different from all other ones, as it seems from the comparison (I am surprised because I assume that the tournaments here in Czech Republic are governed by the Japanese rules, though I did not ask about it). maproom I'm sorry to spoil the fun, but there are not one, not two, but at least three people in the world who understand the Ing ko rule. They are Yang Yu-Chia, Robert Jasiek, and Matti Siivola. The last two are European. As evidence that Matti understands them, here is a link to Matti Siivola's position. RobertJasiek: Mr. Yang claims to understand the Ing Ko Rules but has never answered my questions about explaining them. Only once he answered a specific test question from me about my Prohibition Rule, and from his answer I conclude that that rule agrees to his interpretation very closely, although he uses to state that he does not understand my formalistic language (which I use also in that model rule). - I myself do understand the ko rules well but do not have a profound, general explanation of the preceding distinction of Fighting Ko versus Disturbing Ko yet. - Matti Siivola understands very well how to question the Ing Ko Rules by providing extraordinary examples, which make fun of them. However, he does not understand the Ing Ko Rules as rules well. E.g., when trying to explain them to me by relying on the term Invariation, he could not explain that. Bill: He could not explain invariation because it is not an English word. I think the Chinese original is muhen (pronunciation??? }, which ought to mean no variation. However, Ing seems to have meant something more specific, which he did not define. In the 8-sentence-long "summary of Ing Rules" section-- English Translation: "Moves are unrestricted except for invariation." The Original Chinese for that is "除窮任擇," (pronounced chu2 qiong2 ren4 ze2 in pinyin), or literally, "unless-exhausted [of moves]-free to choose [any]" Note that the character 窮 normally means "poor," but it conveys the idea of "running out of options" in this context. The word "invariation" is also seen in Section 2 of the preface, where the English translation states "A complete ko rule must prevent invariation, and must distinguish between fighting and disturbing ko." The original Chinese is" 完整的打劫規則必須「變窮打劫、劫分爭攪」," or literally: "A complete rule for fighting kos should, in the case of exhaustion of moves, [allow for] fight[ing] a ko and differentiate kos between 'fighting' and 'disturbing.'" ==> Note that the word "fighting" above is used in two different senses. Obviously, such ambiguity does not exist in the original Chinese text, as different characters are used for the act of "fighting" (or playing out) a ko (打劫) and the specific type of ko which Ing called "fighting ko" (爭劫). ==> Here, the English translation states that Ing defines "invariation" as "repetition of the same position or cyclic removal," which is an accurate translation of the original "「變窮」就是同型反覆或循環提取." RobertJasiek: Thanks for the close translation! You are so accurate that I wonder whether you would like to translate more of Ing91, Ing96, Chinese88, Chinese02 (most important: referee ko rules section)? Not that it is really necessary because you do not seem to reveal things that would surprise me, but greater accuracy is never wrong. RobertJasiek: Bill, if you replace the 1996/7 year by 1996, then for consistency also 1974/5 should be replaced by 1974. Then we have the booklet printing years. The 1974 rules became valid in 1975. In case of the 1996 rules, I am not sure whether they became valid in Taiwan from 1996 or 1997, but concluding directly from only the booklet is equally risky. Bill: This definition of hot stones is incorrect. Ing defines a hot stone as "a stone repeatedly contested by both sides over life and death" ( 雙方為死活反覆所爭之子 ). Hot stones only occur in fighting kos. 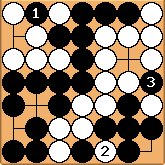 A sequence of play that repeats the current position may be a disturbing ko, and the captured stones in a disturbing ko are not hot. Bill: This is an interpretation of disturbing ko, but one which violates Ing's principle that life and death are determined by play.